An emulation of a classic synth, but with a character all its own. Bring your waders, though - this thing is deep! Excellent sound quality. Multilayered, complex patches. Modulation options galore. All filter modes self-oscillate. Good preset design. The sequencer rocks. Depth could fox newcomers. Keyboard modes are confusing at first. There are many excellent presets onboard the XILS-lab Synthix, although we'd have liked even more. Synthix's built-in four-track sequencer comes with all the trimmings and then some. For those in the know, the expectation is obvious: XILS-lab's new Synthix ought to default to the famous 'Laser Harp' sound heard on Jean-Michel Jarre's Rendezvous LP. This one sound was really the only moment in the spotlight for Elka's Synthex synthesiser. Sure, other people used the thing, but the Synthex is so identified with the Laser Harp controller that Synthix is even being bundled with Kromalaser's modern version of that iconic bit of kit. We're just checking out the plug-in here, however - it's in VST, AU and RTAS formats. "Octo pulses every eighth step, Hexa every sixth, while Hoover spits out a ramp at the eighth step." In fact, Synthix's default patch is a rather pedestrian analogue bass that, while authentic, will do nothing to justify the legend of the real deal. It's only when you begin to dive deeper into this synth that you start to understand the vast potential on offer here. 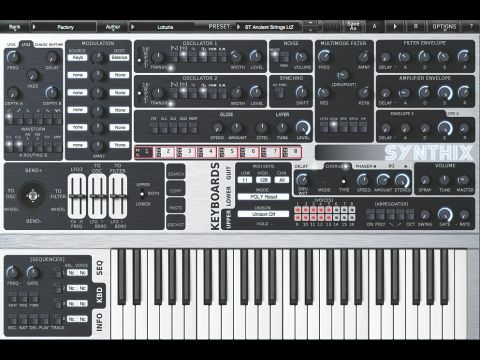 Synthix is no mere rehash of the original Synthex. However, users of that instrument won't be left scratching their heads. Most of the original functions are wedged into roughly the same places on the GUI, although there's a lot more piled on besides. Some differences are subtle - an extra button here, a tabbed menu there - while others are more obvious, such as the familiar XILS modulation matrix in the space where the Tuning section once resided. For those new to the instrument, the layout may at first be daunting. Still, much of it follows the familiar arrangement established by the Minimoog and Prophet-5 so many years ago: control and mods on the left, giving way to oscillators, followed by a multimode filter and envelope generators. Just below the main panel is a joystick on the left, with six parameter assignment sliders. The joystick's horizontal axis can act as a mod wheel, of course, while the vertical controls pitchbend. It can also be routed to the LFO, oscillators and filter. You can choose to tie it to the upper or lower keyboard, or both. Yes, just as with the original, Synthix supports key splits with individual patching and MIDI on both upper and lower sections of the keyboard. The arpeggiator and Unison functions are set per upper and lower section, so you can play, say, a unison bassline with your left hand, while triggering arps with your right. You must assign the 16 voices to each section yourself - we'd have to say that this can be a little confusing. In addition to the upper and lower keyboard modes, there's also a mode designed to work with MIDI guitar controllers. This enables you to trigger up to two voices on a dedicated MIDI channel (guitar-to-MIDI converters usually send out six monophonic signals on individual MIDI channels). A nice touch for the very few that will make use of it. By default, Synthix is presented as a single-layered, 16-voiced instrument. That single layer is impressive. The two oscillators offer four waveforms each (triangle, square, saw, pulse), with pulse-width versions for saws/triangles, and a ring mod option. There's a noise generator too. The results can all be shuttled through a multimode filter that provides low- (12 and 24dB), high-, and band-pass (6 and 12dB) filtering. Resonance is self-oscillating for all modes and there's an overdrive that can be run pre- or post-filter. The four envelopes are of the ADSR variety, though they have a delay setting at the start, which is a nice feature. Modulation is one of Synthix's strongest points. There are two standard LFOs, plus a Chaox model with an X/Y pad. This one is designed to provide some semi-randomness and it's pretty effective. The Rhythm LFO is hard to describe - it provides five outputs, each spitting out a pulse or ramp on specific beat divisions. For example, Octo pulses every eighth step, Hexa every sixth, while Hoover spits out a ramp at the eighth step and so on. Each of the five outputs has a dedicated destination menu and amount knob. Although the architecture of a single voice is powerful on its own, it's in 'multilayering' that Synthix really comes into its own. You can stack up eight entire patches into a single voice. When combined with the aforementioned keyboard splits and layers (not to mention the four-track sequencer), the power and flexibility is further amplified. Some of the factory patches that make use of multilayering left us open-mouthed in amazement. Very cool stuff - if you have the patience to make the most of it. And that's the thing. Synthix can make incredible sounds in the hands of someone willing to invest the time required to learn it. This is a deep instrument with vast sonic potential, and the sound quality is top-notch. Even for bog-standard analogue sounds, it's no slouch; yet a good patch programmer can work wonders with Synthix. The factory sounds exemplify what we mean - XILS hired some of the top guns of the preset-design world to concoct Synthix's, and they did a terrific job at providing a demonstration of what can be done with the instrument. Lotuzia's sequencer-based patches, particularly, are quite inspiring. So is it worth the price? Absolutely. There are few instruments that can produce noises this dizzyingly complex. Synthix has a sound and personality all its own.